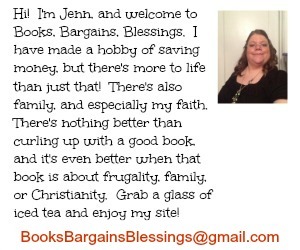 Books, Bargains, Blessings: Paid $23.23 for $153.05 of groceries. 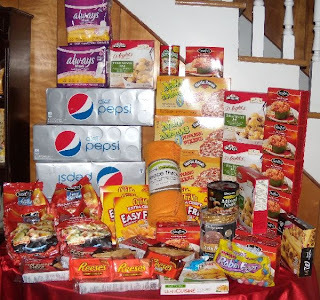 Paid $23.23 for $153.05 of groceries. There once was a joke on a sitcom about "Who buys groceries at a pharmacy?" Well, I do! I usually do a couple big shopping trips before winter hits, and it's about time to replenish. So this was a great day for me! My guinea pig has been needing lots of care and I had a break for a few hours this afternoon right after I fed him and decided to run into town just to get out of the house. I wanted three things at Walgreens, but they were sold out of two of them! However, I discovered a treasure in the frozen foods. They had tons of stuff on clearance. I bought things I knew that we would use. Then I went to CVS. CVS had a promotion on their Facebook page that if you were their "fan" you could print a coupon for one totally free candy or single serve beverage to $2.00. My clerk tried to argue that "any" didn't mean "any" but what waas pictured on the coupon. She wouldn't even try it. Never mind that the dictionary says "any" means "Without specification or identification". She kept insisting I could only get Orbit gum with the coupon. I pulled out my phone and started dialing the number to corporate. (I rarely go this route, but have called corporate from the store before. I've found they will at least try whatever I want before I actually call corporate and I have never asked them to do something that isn't allowed.) At which point she said that was fine, no need to call, she would see if the register would accept the coupon. (It did with no problem.) Then she made me get something that was sixty cents. I'm not sure the reasoning behind that, didn't argue that one, just grabbed a blow pop. So what all did I buy in my shopping trip? I paid a total of $22.40 and saved $105.43 and I got $8 back to spend on my next shopping trip. FANTASTIC. Can we become coupon buddies, I need some serious organizing tips. You did really, really good. I love Walgreens for "grocery shopping". I always buy the eggs (when they are .99) and use my stash of RR to buy milk. One thing I don't buy is my 2-liters of soda. My store always seems to have "old" sodas and being the soda snob that I am, need it to be fresh. I have found that couponmom.com is the way to file and I have written a couple of posts on organizing coupons and such ..if you have seen them? Gotta love those arguing clerks! I wonder how much they actually end up saving the companies from all us couponers? :) Glad you were able to get a good haul! WOW I need to go shopping with you! I am amazed. I might try that one time. I never look at the prices there. This is an unbelievable find. While my husband was out, I called to find that he was near a Walgreens and told him about the buys in the frozen food section. Normally, he argues with me that drug store food is old & dated but he agreed to look. He said all that was left was Stouffer's small lasagnas for 90c each but didn't buy them. And he is not one to go looking at the several Walgreens in our area....came home with ONE bag of Twizzlers on sale for me. But, thanks for the heads up! Sounds like you will have some yummy meals for a long time to come. Susan C.